The InterContinental Hotels Group’s Holiday Inn brand is the first major hotel brand to launch a travel app for Windows 8 -- the newest version of the Windows operating platform for a variety of PCs and tablet devices. The new app allows guests to find and book rooms at any Holiday Inn hotel, as well as at the more than 4,500 IHG hotels worldwide, including the InterContinental Hotels & Resorts, Crowne Plaza Hotels & Resorts, Hotel Indigo, Holiday Inn Express, Staybridge Suites and Candlewood Suites brands. Through the app's tile on the Start screen, guests can directly search for hotels; see property photo galleries and descriptions; and view existing reservations. Priority Club Rewards members also can view their status and check their points balance. 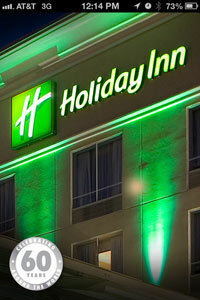 "Holiday Inn has transformed the hospitality industry with its innovative and modern approach to guest services, and has a rich heritage of firsts in the industry, so it was a natural fit for our first app for Windows 8 to be rolled out with this industry-leading brand," said Michael Menis, vice president, Web and interactive marketing, IHG, in a release. The app is available for free download from the Windows Store. The new app aims to build upon IHG's success in developing innovative, consumer-facing technology that facilitates guests' access to e-commerce tools for hotel stays. "Developing an easy-to-use e-commerce app furthers our commitment to identifying and leveraging emerging technology to drive satisfaction for our guests, while optimizing revenue delivery for our hotels," Menis added. In 2011, the Priority Club Rewards app for Windows Phone was introduced as yet another first for the hotel industry on a Microsoft platform. Apps for IHG's existing hotel brands and Priority Club Rewards loyalty program are also available for iPhone, iPad, Android, BlackBerry, and Kindle Fire. The hotel group is promoting the app on its Web site, on Twitter and Facebook.